Delicious toppings and gooey, cheesy goodness make pizza one of my favorite foods of all time. With all the possible toppings that a pizza can have, it's definitely not a boring food. But when I'm dieting, I try to avoid eating pizzas because of the carbohydrate content. Sometimes, however, I succumb to this yummy temptation, and my efforts to lose weight go down the drain. Still, because I love pizza and I need to diet, I figured that I had to come up with a food plan. Maybe there are healthier pizzas out there? What about toppings? Maybe, by opting for more nutritious toppings, I could more or less stick to my diet regime. Luckily, deciding on pizza toppings is not an exact science. Rather, it's an exciting adventure wherein you can truly explore your preferences. In my quest to discover healthier pizzas, I found out a few things about toppings. Let's see what food items are actually good to have on top of a pizza. Contrary to popular belief, eating cheese is not really that fattening. Cheese is a dairy product, and dairy products contain linoleic acid that helps in speeding up metabolism. It's actually good to have about an ounce of cheese each day to increase metabolism. Also, get a boost of calcium for your bones with cheesy pizza. Great options include: parmesan, cheddar, ricotta, provolone, and mozzarella. 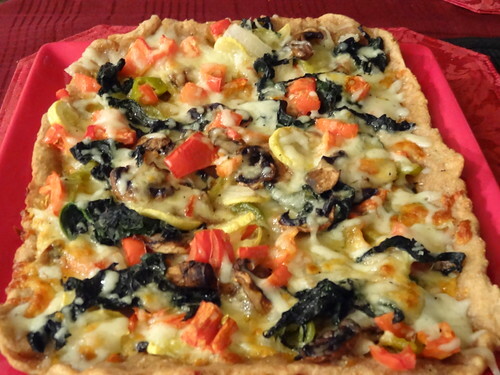 Seriously, vegetables on pizza? Actually, vegetable toppings are becoming really popular. Not only do veggies taste great with cheese, but these also add some crunch and texture to food. We all know that most vegetables are fibrous, and eating foods that are rich in fiber gets your juices going. Your digestive system uses up more calories to process fibrous foods. Plus, you get many essential vitamins and minerals too. So, consider having some broccoli, olives, garlic, pepper, spinach, and tomatoes on your pizza. Fruit pizzas are fresh, healthy, and scrumptious too. You can top pizzas with fresh fruits, like pineapples, berries, oranges, grapes, or bananas. Go for canned fruits if you prefer. Do you have a sweet tooth? Why not make a glazed fruit pizza? Just drizzle your choice of fruit sauce, like an orange-lemon glaze, over your toppings. Mushrooms are known as "natural weight loss foods." Why? Mushrooms absorb a lot of flavor, and they are low in fat and sodium. If you regularly use flavor enhancers when cooking, you won't have to use them while having mushrooms because these delectable fleshy fungi contain glutamic acid, which boosts food flavors. But be careful when eating mushrooms because there are also several types that are toxic, especially when uncooked or improperly prepared. So, only go for mushrooms that are often used in cooking, like portobello, shiitake, morel, and chanterelle. Build more muscles and increase metabolism with all-meat pizzas. If possible, skip the ham, sausage, and bacon. Go for other healthy meats like chicken, fish, squid, and shrimp. These contain fewer calories than ground beef or pork meat and are succulent toppings too. But you can still indulge in pepperoni or bacon every now and then. Photo courtesy of nuchylee at freedigitalphotos.net/. Claire Hatton is a freelance writer who often blogs about food. Her favorite topic is pizzas. She also writes for Sergio's Pizza and many other food establishments. Submitted by soniya sharma (not verified) on Sun, 10/21/2012 - 23:43.